Happy 8th birthday to my handsome prince, Mason. I loved you before I met you. Now, you ask me several times a day, "Mom, do you love me?" Yes, of course, I do. It can get a little annoying to be asked so many times, but I'll keep reassuring you, and I know you are trying to make conversation. 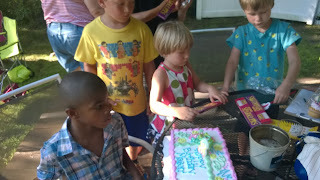 We had a party for Mason in our yard on July 17th. That was a big day since I was also the guest speaker at First Congregational UCC, I was trying to pack for a very long trip. I love having friends over. Nothing makes me happier than seeing kids playing in the backyard.